ECSRA was back at Flora Indica, 242 Old Brompton Road for their 2018 AGM. The Hon. Treasurer, Alex Tullett, chaired the meeting and read out the Chairman’s and Hon. Treasurer’s Annual Reports. 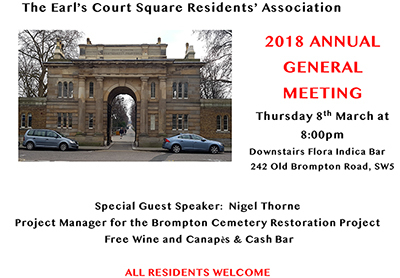 The special Guest Speaker, Nigel Thorne (Project Manager for the Brompton Cemetery Restoration Project) brought everyone up to date with a presentation of this fascinating multi-million pound project, which is on our doorstep. A reception with wine and canapés and a cash bar followed and ECSRA was pleased to welcome all three Earl's Court Councillors to this annual event.